Cake Wrecks: Dora the "Cascajo"
And here she is looking at you, kid. Or she might be looking at the person next to you, or someone behind you...it's kind of hard to say, really. Karin D., Jenn E., Derek C., por favor manténganse se alejado de las puertas. Wow, I love the *ahem* chubby dora! hahah I love the monorail spanish -- that's the extent of mine as well!! *in Fat Albert voice* HEY HEY HEY Its Dora! Classic!!! The monorail is my favorite. These cakes are not. Failers, no failing! With the giant blue hair that last one could pass for Tracy Turnblad from the broadway musical Hairspray! It looks a lot like the orginal cast recording album cover. That is the ONLY spanish I know!!! I knew exactly what it meant when I saw it, and I wasn't sure exactly how it fit in...but that is awesome!! Not sure what you were going for, but the definition I know for cascajo is rubble. Holy CRAP. Those are some seriously jacked up "Dora" cakes. I can't be eloquent in the face of these train wrecks. Jacked up. Oh, and as for the last cake, are you sure that's meant to be Dora, and not Jenny from "My Life as a Teenage Robot"? My 4 year old son keeps saying "I want to see the fat one again"!!!!! He loves your blog--and so do I! Horribly hilariously definitely "pieces of junk." Oh boy. Oops, Oh girl. I think Dora may have been visiting the chocolate tree? I would use the word "desastres" instead of cascajo. Estos pasteles son desastres. Wow, that first one totally looks like Asian Dora. Fat Dora made us spit out our coffee! Ha ha! I worked at Disney World! To this day, that is the only Spanish I know. I even have the accent down! Let's picture standing beside your daughter or granddaughter and preparing to cut any of these cakes. What message does that give your little girl? "Would you like a piece of Dora's hair?" Yum. "How about a foot?" Poor Dora....looks like fame has gone to her head and she's been hanging around with the wrong crowd! Well, if you don't consider the crosseyes and such, the first cake is actoually pretty decent. And you gotta give credit to the chubby dora. You can still tell it's her, it's not as bad as the dora in a dress from a couple weeks back, and it does help the self-esteem of the youngster eating it (well, hopefully...). The other two... welll... let's just say the baker "est loco" (sorry to butcher the spanish - I speak french). lol, they sell t-shirts at disney that have the monorail saying on them!! I got one last yr and get great comments on it when I wear it. GOOD STUFF!! the camera in picture 3 is 'click the camera" from diego, a totally different show. i should know..my 4-year-old little brother knows the song by heart! It's a wreck, it's a wreck, it's a wreck, it's a wreck, IT'S A WRECK! Haha! Love the monorail comment! I knew exactly what it was when I started reading it!! Too funny! OH NOES! Fat Dora stole Murderface's haircut! As for the last Dora, I thought maybe the vampires from Twilight had managed to drain her of all blood. Except for the eyes, that first cake was actually done very well. Not wrecky enough. the last CW reminds me of what Anthony Bourdain says: "Special" means "Trying to Get rid of it." Just curious why you didn't go with "Explorador" for explorer? When I was learning Spanish, I learned the word "cascajo" as junk or gravel. I have since learned it's a form of money also (in Puerto Rico I believe). I suppose the Dora the Junk works for some of those cakes though, especially Dora-Budda. first LOLs of the day... thanks Jen! Ooops, when I said above "to the tune of the backpack song" I actually meant to sing it to the tune of the "map" song. Duh. That wouldn't go with the backpack song at all! That last one looks like Dora and XJ9 (from My Life as a Teenage Robot) were melted together. "please they stay remote of the doors." That's like the signs for poor, unwanted critters that read: "FREE TO GOOD HOME." The so-called hair on that last thing looks like two alien life-forms schmoozing and sharing an inside joke between the two of them. See the *smile* on the one on the right? The only thing *special* about this is that it's probably been sitting there for about a gloomy month or two, waiting for that one desperate customer who doesn't care as long as it's semi-edible. A real cake emergency. Cascajo can mean either: fragments of rocks or other things that break; fruits with a hard shell (ex: nuts); broken or useless vase; old furniture. I scrolled thru the post with my 2-yr-old daughter, who proclaimed the final Dora to be "Funny...she's kind of WEIRD!" Manager's special = zombified Dora? Ay, Dios mio! um, according to babelfish, "cascajo" means "gravel"... hmm, what were you going for? in any case, the cakes are CRAZY! That last one is ZOMBIE DORA. I mean look at it... it must be undead! Also I love how on each cake Dora seems to be a different ethnicity :) Hilarious. Our family loves your blog! Sweet mother of cakes! 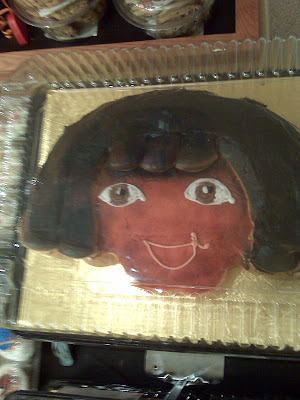 My niece had a Dora cake and her Gamma did a good job, at least she wasn't cross eyed or overweight! God I love this site! I love the monorail part! You saved me from trying to remember what it says. My children laugh at me when I por favor blah, blah, blah, blah, blah, blah at them! The EXTRADora is cracking me up. 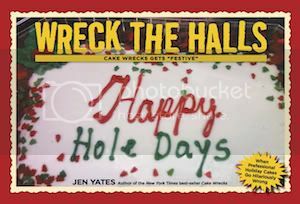 Isn't that really the weight problem right at the core: That your physical self is made up of entirely too much cake?! It boggles the mind. Now hit the treadmill, Dora. Okay, the first one was not that bad honestly. She's a little cross-eyed, but I have a slight problem like that in real life. The others though "shudder." are you SURE the last one is Dora? yeah i looked up cascajo and everything i found said it meant rubble or pebble. 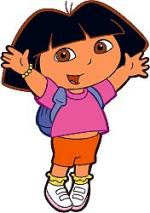 if you want to say explorer it should be explorador or exploradora in dora's case....omg is that why she's named dora?! i've always wondered that. because seriously dora the explorer does not rhyme. but dora the exploradora...well it ain't great but it makes way more sense! My 4 year old daughter, who normally doesn't notice things like weight, started laughing when she saw "large" Dora and told me "Dora ate too much!" As we say in the south - That's special - in a short bus kinda way - Bless her heart! Ah! The East Coast version of Disney Spanish comes from the monorail! Here on the West Coast those of us learned our Spanish from Disneyland's Matterhorn: "Remain seated please; Permanecer sentados por favor." How did you even know that the last one was Dora-too funny! Yes, "cascajo" works brillantly for what you were looking for. True, it also means junk, but it's all about usage. Dictionaries are great, but they can't tell you everything! "por favor manténganse alejado de las puertas"
¡Me encantan estos cascajos de Dora! omg I have to buy that monorail t-shirt when I go to disney this year... is it in a special store or will it be in all of them?? that first one (the cross-eyed Dora) is my fav. Hilarious! At least she resembles Dora, even if it looks like she's dizzy with vertigo or whatever. The rest...hmm. The first one wasn't so bad, except she looked more Asian than South American and, well...the eyes, obviously...but overall, the craftsmanship could have been much much worse. . I just loved the 'supersize' Dora, though. And the creepy 'ghost-Dora' was a bit on the wrongly awesome side. Oh god, I have a sinking feeling rock fragments are the new Epcot. Aside from the ummm unfortunate...eye situation...in number one and the slightly too pale Dora, it's the best of the lot. Now, the others are hot messes. WV: leure -- like lurid, only more sophisticated. GREAT post, and I especially LOL'd at the end with the Disney World monorail reference...fond childhood memory! Not cake related, but I've just realized why Dora is a brunette with a suntan: here in France, Dora teatches... english! Was the chubby Dora produced from a mold? Is there a Chubby Girl Cake genre out there? The mind reels. And the last, I think, was Dora of the Dead. With a graduate degree in Spanish Translation, I'm going to tell you, Jen, don't sweat the "rubble". You used a correct translation for coloquial usage and as Mar says, it's an idiomatic expression. People from every corner of the Spanish - speaking world will have a different word for "wreck" it's a question of localization. Best example of localization in English would be the difference between "flat" and "appartment" or "lift" vs. "elevator". Neither is wrong, it depends on who's speaking and who's listening. *shrug* Meh. Dora is pretty terrifying in those wrecks no matter what. That was a fantastic job on cake decorating. As a little league baseball fan and coach, I know important it is to provide good detail and tasty treats for the little ones. Great job and fun article. Good use of cascajo, too. As for the other cakes.....just wow. That one Dora looks like she could be a mountain. haha looks like she has a lazy eye. That last one looks like an anime Dora. Hahaha I actually saw a "Dora" cake this morning, but at first glance I thought it was Jabba the Hut! Oh, no the fat one isn't Dora. It is her older sister Consuela who has a "gland problem" that no one is allowed to talk about. Poor Consuela. I think the last one is the ghost of Dora past. There's a little something for you over at my blog! hahahah, before I studied Spanish at night school the Disney World monorail was my only phrase too! Or the best..."All clear" *beep beep* (my mom and I still say that from time to time). Woot! I can't wait to go back to Disney. I was looking at this post while laughing, when my three year old looks over my shoulder and says "I want that one for my birthday!!!" Kids are such forgiving critics. wow I work in a Supermarket bakery and these never cease to amaze me. I like to think our cakes are good. And being the total Disney geek and castmember that I am...I have the whole monorail speil on my IPOD "Welcome aboard the Walt Disney World Monorail, your highway in the sky to the Magic Kingdom..."
I LOVE the WDW monorail spanish! I can recite that, too. It puts us into that club of people who spent too much of their vacation on the monorail. Did you know it's the fastest ride at Disney? lol I loved the overweight Dora. and how funny is this?! The day after my youngest two's birthday where I made them a Dora cake.. If you ignore the eyes and the pale skin tone, the first cake is pretty well-done, in my opinion. Is the last one "Goth Dora"? OMG those Dora's are horrible! I will be laughing about that Chubby Dora for day. :) That's really hilarious. But...given the color of the hair on the last Dora...it's strangely appropriate here. Oh wow...that is hilarious! I just linked up to your post from Jennifer over at Musings of a Blonde Mom and I can see why you were in her top blogs. I will definitely be back! Hey, that's the only Spanish I know too, and from the same place. When did Dora become an elephant? Oh my! I actually laughed out loud at the first one! too funny....and I'm still laughing!!! Disney has the monorail spiel on a shirt! It is my favorite T shirt! That last one looks like she's trying to steal my soul. NO Dora! I won't let you! Seriously, that one looks like a true horror story. I totally LOVE Chubby Dora! Not only does she look like enough cake to offer everyone seconds but, she's also promoting a positive self image to children everywhere! Awesome! Jen, once again you have made me laugh out loud. Your cake commentary is brilliant! Keep up the good work. If you want your kids to stop watching TV, that Manager's Special is definitely the cake to give them! Haha, Jen, my Spanish is a lot worse than yours. 'Cause my spanish turned out to be french. :( So, uhm, I didn't understand any of the spanish you just said. Bahahah. Is the last one Dora the Geisha? After seeing the large Dora I realized I must have missed the episode where Dora spent a lot of time exploring the Little Debbie factory. I really don't think the first one is that bad-- the eyes are a little off, but so what. I find it stranger how pale she is in that one-- she looks kind of white-washed to me. The second one makes up for the blanching, though. Perhaps those two should have had their frosting blended? Between the two of them, they have the right amount of melanin. The first cake looks like Dora's been doing tequila poppers. the others are just icky. I don't have much imagination before 12. Hahahaha Jen, I thought I was the only person on earth who still (like 10 years later) has that little Spanish monorail speech memorized! That is pretty much the only thing I know how to say in Spanish too. Made me laugh right out loud. Cascajo is like gravel or debris - what were you trying to say? Wreck? Desastre would be better. That first Dora cake is just creepy. LOL at the monorail - my DH goes around saying that to his students when he opens the door at school - we even have shirts from Disney that say that on it because he says it so much! 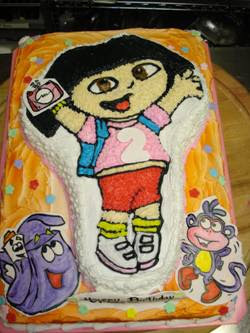 The cross eyed Dora cake is not that bad really. 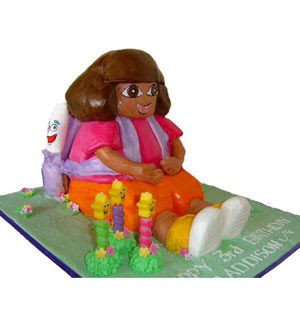 The "fat Dora" cake is just hilarious! Your last line is the exact extent of MY Spanish for the same reason!!!! Go repetitive Disney monorail! I learned it...18 or so years ago and I still remember it!! I believe the last one is supposed to be from the show "My Life as a Teenage Robot"
wow, surprisingly they look like the real one. =) or at least the first one does.. maybe not the eyes? I... laughed so hard I cried. 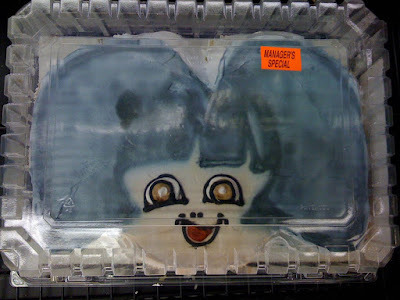 And I can only assume that the one "special" Dora cake was made a Manager's Special because it was so - let me see, what is the word - special. That is the sort of cake people get when they are having a craving for cake and don't care what it looks like, or about the funky bitter black icing. It's also the sort of cake that when a child gets it, they cry (but not from amusement). Maybe it's just me, but Chubby Dora's face looks uncannily like something out of the anime Azumanga Daioh. No, really. She bears a striking resemblance to Chiyo-Dad. I have tears in my eyes from Fat Dora and Wu-Tang Dora. my kids laughed so hard at these cakes. They're five and four and even they can recognize a crappy Dora. Aww. 1st cake Dora has strabismus like me. (I think she's cute anyway). "...Speaking of gaining" hahaha. I love your blog! Woah Dora! Time to slow down on those doughnuts!! And is the manager sure the last cake is Dora...? I think the translation site was, in fact, a prank.